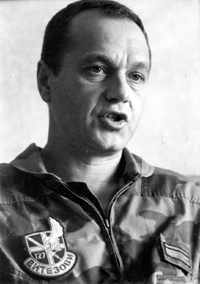 RTS (Radio Television of Serbia) broadcast on the 27.03 interview with Yugoslav Air Force pilot Major Nebojsa Nikolic. He take of with his Mig-29 to intercept NATO armada in the evening of 24.03. When the radar screens of the YA Air Defense started blinking indicating the arrival of an airborne armada on March 24th, the first squadron that was sent up to counter the attack were the men of the King Lazar's Knights squadron. For their conduct in battle all of them have received the Medal for Courage and have been promoted to a higher rank. As soon as I took off - says Maj. Nebojsa Nikolic - I noticed the glow of explosions on my left and on my right. - in the direction of Pancevo and Ruma. My MiG was climbing rapidly and soon I could see the same scene in the direction of Novi Sad. Flying above me were about two dozen state-of-the-art enemy planes. Cutting across the Panonian plane with their destination Belgrade they were unloading their deadly cargo. Astonished by my presence and my determination to cut them off, they quickly turned against me like a pack. I had only just taken off and those are the most difficult conditions for a dogfight. "To be an effective means of defense a combat aircraft must reach adequate speed and altitude." Say all manuals. After the take off I headed towards northern Vojvodina and evaded the first enemy missile. I switched my on-board radar on and armed my arsenal. Just as I did it I had to maneuver to avoid another enemy air-to air missile. Then came a third one straight form a pack of 24 enemy planes. I wonder whether any well-paid and insured western pilot would take his chances with two of our planes let alone two dozen. Although they are denying their losses, it�s a known fact that the Yugoslav skies have become a graveyard for western planes and pilots. This is mostly due to the fact that we fight with our heart and with the determination to are defend our country, and they are doing it for money and a with life insurance. When I selected one as my target on the radar and positioned my jet accordingly, I launched what we call a "small" missile. I did not manage to verify the hit, because my MiG 29 was hit in that moment. The fighter turned into a torch.The flames enveloped the cockpit. Because of the smoke and the flames I could not see either the instruments or anything outside. At that point I was at an altitude of 3000 meters over the town of Titel and I was heading north towards Zrenjanin. My trusted MiG, the plane I�ve flying for more than ten years, was heading down. When I reached the altitude of about 2000 meters I decided to catapult myself out of the burning jet. I landed in the middle of a field some 400 meters away from my burning MiG. The flames were illuminating the entire area so I quickly moved away to escape the persistent NATO pilots from locating me and killing me. In the darkness of the nigh I found refuge in an irrigation trench. Having spent several hours hiding and trying to reach the town of Senta, he decided to turn back towards the wreck where he was found by our rescue teams and taken back to the airport. The pilots from my squadron were overwhelmed with joy when they saw I was alive and well. After a short debriefing I was transferred to the Military Medical Academy for a check-up. It was almost three in the morning when I finally called my wife Olga. It was dawning when she and my older daughter Sonja came to visit me. A few days later the younger daughter, 11-years-old Tanja finally had a chance to embrace her daddy. Major Nikolic was discharged from the hospital and sent home. He contacted his "Knights" immediately and offered to join the squadron. "Rest a bit, we have sufficient crews to take on the NATO campaign" � he was told. Since major Nikolic came home from the hospital, the telephone is constantly ringing. Friends keep calling to hear how he feels. Just the other day, when he went to buy some groceries and the daily papers, a lady in her late seventies recognized him and asked if she could hug him. Her motherly kiss was a special medal for this brave member of the "Knights": squadron. 30 minutes after this event RTS broadcast information that one enemy aircraft was shot down. One hour later SKY-news conformed this information. Next day NATO officials declined.